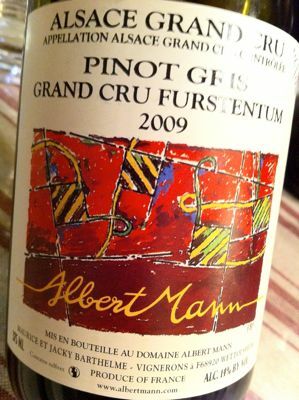 Furstentum is a heterogeneous Grand Cru located high above the village Kientzheim due west of Colmar. Although the vineyard is located in due south, Furstentum has an ideal microclimate. Here, the two families who constitute the firm Albert Mann, Maurice and Jacky Barthelme with wives, make biodynamic Riesling, Pinot Gris and Gewurztraminer of remarkable class and quality. Furthermore, all products, from the popular "Edelzwicker" Senteurs des Vignes to the Grand Cru wines from Pfersigberg, Hengst, Schlossberg, Steingrubler and Furstentum are crafted with incredible skill and typical of their terroir.